The US secretary of state has said the Middle East peace process is "moving in the right direction" following talks with Israeli and Palestinian leaders. Condoleezza Rice said she fully believed a final status agreement was possible before President George W Bush leaves office in January 2009. Palestinian leader Mahmoud Abbas said he hoped for a deal this year. Campaigners have accused the Israeli government of failing to halt new Jewish settlements in the territories. Peace Now, an Israeli group, said construction had continued in the occupied West Bank and East Jerusalem since November's Annapolis meeting in the US, which relaunched the peace process. It said there was now almost nothing left of a promise to freeze settlement construction but the Israeli government denies it has ever given such a promise. 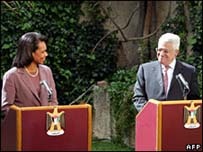 Ms Rice was speaking after meeting Mr Abbas, the president of the Palestinian Authority, in the Jordanian capital, Amman. Earlier, she met the Israeli Prime Minister, Ehud Olmert, in Jerusalem. She also held three-way talks with the top Palestinian negotiator, Ahmed Qurei, and Israeli Foreign Minister Tzipi Livni. Ms Rice told reporters she was impressed by the work which had been done since the peace process was relaunched at Annapolis in November. Mr Abbas said he was confident a comprehensive peace could be achieved this year. "We, the Israelis and the Americans and all the concerned parties in the region, are working to achieve this," he added. He said he was next due to meet Israel's prime minister on 7 April. Mr Abbas broke off negotiations last month during an Israeli military offensive that killed more than 120 Palestinians in the Gaza Strip. Israel and Mr Abbas's Palestinian Authority earlier "agreed on concrete steps to implement the roadmap" and ease Palestinians' lives in the West Bank. Peace Now warned the Israeli government it was repeating one of its "worst mistakes" by approving a surge of construction in the past five months, with 946 homes planned in the West Bank and at least 750 homes in East Jerusalem. But Mr Olmert said that "all the reports of dramatic construction projects in the [Palestinian] Territories" were untrue. "And it's not true that we're building in violation of commitments that were made," he told a meeting of his Kadima Party. Mr Olmert said his government would continue to authorise construction work in the occupied areas it wanted to keep in any final peace agreement. Later, the Jerusalem municipal authority announced plans to construct 600 new apartments in the settlement of Pisgat Zeev in occupied East Jerusalem. Ms Rice said the US opposed any settlement expansion. Israel has occupied the West Bank since 1967, settling about 400,000 Jews in the area, including East Jerusalem. Settlements are considered illegal under international law, though Israel disputes this.